SpaceX has been teasing potential Mars plans for a while now, but the company just announced a launch date—and it’s soon. They plan to launch to the surface of Mars in 2018. Especially intriguing is that the announcement refers to the spacecraft as the “Red Dragon.” Does this mean that we’ll be seeing an update to the spacecraft so that it can handle the conditions of the red planet? We hope so. We’ve reached out to SpaceX for details and will update as they come in. Update 1:30 pm: A spokesperson for SpaceX has shared some additional details about the planned mission—and they are, to put it plainly, thrilling. It will be, as expected, an uncrewed flight. The purpose of these initial missions will be to figure out how safely land large payloads on Mars. To do that, SpaceX plans on launching their Red Dragons with the Falcon Heavy rocket—an ultra souped-up version of the Falcon 9 rocket that we saw land on a barge earlier this month. Most exciting, though, is that these Red Dragon missions are also intended to lead into upcoming plans for building something on Mars. Elon Musk previously promised to reveal details about plans for a Martian city at the upcoming International Aeronautical Conference this September. 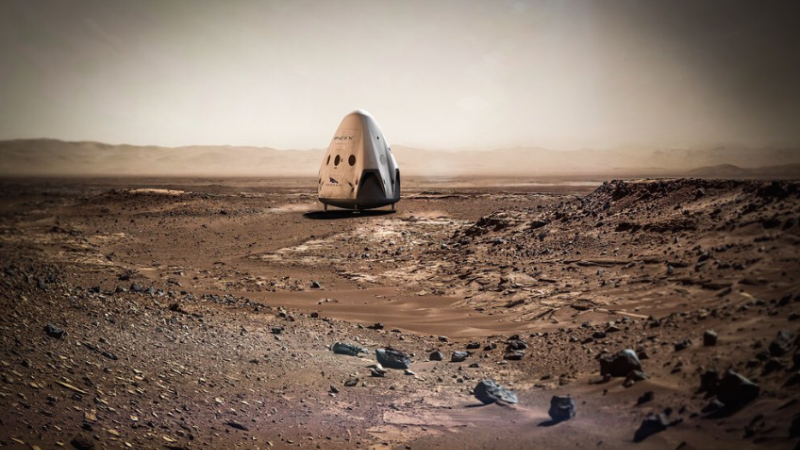 According to the spokesperson, the Red Dragon missions will inform that future Mars colonization architecture.